Harsh has more than 24 years of global maritime, marine insurance, logistics and maritime/admiralty law experience, having worked in Australia and overseas. As one of Australia’s experts he has worked across the maritime field with success as a Marine Surveyor, Marine Claims Adjuster, Marine Broker, P&I Correspondent, Regional Manager and Senior Maritime Consultant. Bringing all these technical skills under one roof, Harsh floated the specialist maritime consultancy & surveying firm: HC Maritime Consulting Pty Ltd in August 2016. With expertise across marine insurance, logistics and admiralty, he is also a leading global consultant in specialist areas such as Commercial Hull & Machinery, Protection & Indemnity, Cargo (Inland & Ocean), Stock throughput, Project Cargo, Logistic Operator's & Freight-forwarder's liability, Carrier's & Bailee's Liability, Ship-repairer’s liability, as well as, maritime Professional Indemnity. Harsh, as Director of HC Martine Consulting, is committed to devising boutique solutions for each client. 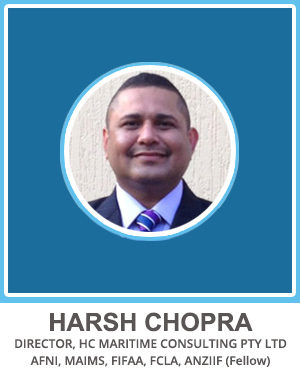 He embodies HC Maritime’s focus on unmatched product, price and personalised service. Harsh's LinkedIn profile can be accessed here.